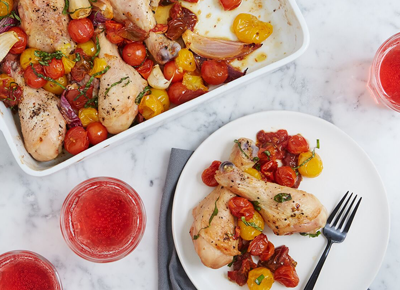 News flash: Roast chicken doesn't have to be boring. So instead of throwing the whole bird into the oven again, get creative. Try a different cut that's seasoned perfectly. Like our roasted buffalo chicken wings recipe. 1. Preheat the oven to 425°F. Line a baking sheet with aluminum foil and grease it with nonstick cooking spray. 2. Arrange the wings on the prepared baking sheet and season with salt and pepper. 3. In a medium bowl, stir the buffalo sauce with the butter and garlic powder to combine. 4. Brush about half the sauce onto the wings. Roast for 12 to 15 minutes, or until the sauce looks dry on the surface of the chicken. Remove the baking sheet from the oven and brush the remaining sauce onto the chicken. 5. Continue to roast until the wings are fully cooked, 20 to 25 minutes more. Serve hot with celery on the side and blue cheese dressing for dipping.